Many people head to London to enjoy the capital’s great shopping opportunities and Oxford Street is a must for those looking for some retail therapy. Oxford Street is home to an amazing number of shops ranging from high-street fashion brands to top designer names – making it ideal for a whole host of budgets and tastes. The street is located in the City of Westminster in the West End of London and it is regarded as the busiest shopping street in Europe. In fact, Oxford Street’s shops offer around 1.5 miles of buying opportunities and it is estimated that over 100 million shoppers from 200 countries flock to the area every year to indulge in some retail therapy -spending around £4.9 billion. The famous street offers shoppers more than 200 key British brands and currently employs more than 50,000 people. Found between Marble Arch and Bond Street, it is well connected with public transport links so ideal for anyone staying in central London hotels close to Paddington. With so many shops to visit, here is our guide to the ones that are really worth visiting. One of the largest stores on Oxford Street and one of the best department shops in the world, Selfridges is a must. Founded by Harry Gordon Selfridge. The store was opened March 15th in 1909 and was even the subject of a television show called Mr Selfridge. Nowadays it is the perfect destination for those looking for the latest fashions from all the leading luxury brands. It is also claimed it has the largest footwear department in the world, with 4,000 pairs of shoes on sale at any one time. There are also plenty of options to eat at Selfridges, including a decedent Champagne and Oyster Bar. For those looking for some more budget shopping options, then Oxford Street’s Primark shops are a must. Although, there are plenty of Primark branches in other areas of the country, the two on Oxford Street are quite a bit different. The first was opened in 2007 at the Marble Arch end of the street and has two very large floors of clothing and accessories. However, there is also another four-storey flagship located close to the junction with Tottenham Court Road. It boasts exposed brick walls, giant LED screens and a special space where the latest fashion lines on offer can be displayed. It is also offers 82,000 square feet of items for women, men and children. Oxford Street is also home to the UK flagship store of the famous Marks & Spencer chain. The London branch is the retailer’s largest store and as well as the normal range of clothing, it also has a comprehensive homeware department and a great food hall. If you are in the area of Oxford Street, then make sure to take a photo of the famous Marble Arch. The iconic symbol designed by architect John Nash and was built in 1827. It was originally designed as the state entrance to the cour d’honneur of Buckingham Palace but was relocated to its current position at the junction of Oxford Street, Park Lane and Edgware Road in 1851. When is Oxford Street open? The majority of shops along Oxford Street are open from 9am to 9pm Monday to Saturday and 12pm to 6pm on Sundays. In the run-up to Christmas, many of the stores also extend their closing hours on Thursdays to ensure everyone has time to buy those essential gifts. 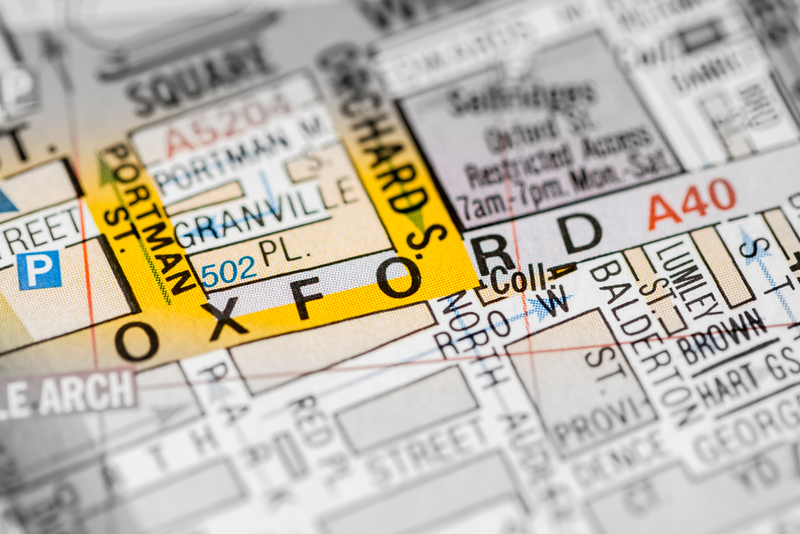 There are plenty of bus routes to Oxford Street:3, 6, 8, 10, 12, 13, 15, 23, 25, 53, 73, 88, 94, 98, 113, 137, 139 & 159. It is also very easy to travel to the shopping street via the London Underground network. There are plenty of tube stations in the area including Bond Street on the Central Line and Jubilee Line, Marble Arch on the Central Line, Oxford Circus on the Bakerloo Line / Central Line / Victoria Line, Piccadilly Circus on Bakerloo Line / Piccadilly Line and Tottenham Court Road station on the Central Line / Northern Line. If you prefer to drive then there is the Q-Park Oxford Street car park which can be found at the centre of Oxford Street just behind John Lewis at Cavendish Square Gardens. There is the option to get discounted parking if you book your space in advice. Share the post "Head to London famous Oxford Street"
This entry was posted in London Street. Bookmark the permalink.